Conference Date and Time: Saturday September 22, 2018 from 9:00 a.m. to 4 p.m. Hear Keynote speaker Warren Bittner and select from several informative sessions including Dr. McCoy's talk on town records. Date and Time: Sunday, May 20, 2018 2 to 4 p.m. Deeds can help you find ancestors who have escaped the census taker and can provide information on family relationships, migration patterns, wealth, neighbors and more. Learn how to find them, how to read them, and how to use them to solve genealogy problems. Dr. Carol P. McCoy, President of Find-Your-Roots in Brunswick, Maine and president of the Maine Genealogical Society, has been tracing her family history for over 30 years and helping others find their roots since 2000. She specializes in New England, New York and West Virginia, and focuses on helping people learn the details and stories about their ancestors' lives. She has used local records such as deeds, town records, and tax records to solve many genealogical problems. Often overlooked, deeds and land records can provide useful clues to finding and learning about our ancestors. This is especially true for areas where Probate Records have been destroyed. Carol McCoy getting ready for the genealogy broadcast of Maine Calling with Keith Shortall of Maine Public Radio.A lot has happened since I last posted news on my site. I will be changing web hosts and redesigning the site soon. In the meanwhile there are several important announcements. Dr. Carol Prescott McCoy is now the President of the Maine Genealogical Society (MGS), which has over 800 members and serves 11 chapters throughout the state of Maine. You can learn more about MGS by visiting maineroots.org. She will be visiting these chapters over the next two years. Dr. McCoy was a guest for interactive session on genealogy on the popular Maine Public Radio program “Maine Calling” on Wednesday April 18th. 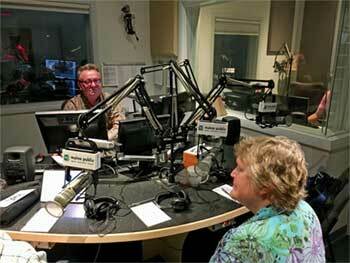 Hosted by Keith Shortall, Carol was joined by Nancy Mason, who specializes in DNA and genealogy. Several listeners called with thought-provoking questions. You can listen to a rebroadcast at this link. The Maine Genealogical Workshop on Writing Your Family History last April 21st 2018 at the Elks Lodge in Augusta was a smashing success. Joseph C. Anderson, II, the MGS Publications Director, was the main speaker. Carol did an interactive session with Joe—Getting Your Article in Print—A Writer and Editor’s Perspective. You can find a copy of the syllabus for Carol’s talk for this session at this link. 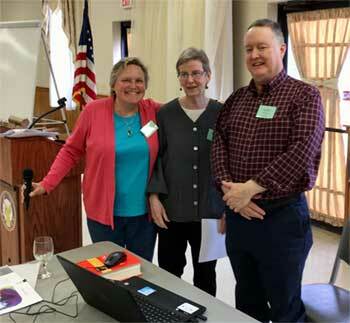 Carol McCoy with Deb Nowers and Joseph C. Anderson II at the Maine Genealogical Society Spring 2018 Workshop on Writing Your Family History in Augusta, Maine. Carol had the privilege of being a co-author with Peter Small and Maureen Taylor on a wonderful new family history The Metcalf and Small Families: Some Descendants of Michael Metcalf of Dedham, Massachusetts, and Edward Small of Kittery Maine (Boston: Newbury Street Press, 2018). You can purchase this book through the book store on www.americanancestors.org. Carol has just finished transcribing the Vital Records of Durham, Maine to be published by the Maine Genealogical Society in 2018. When available, you will be able to purchase this book at the MGS online book store at www.maineroots.org or in person at one of our conferences. Maine Public Radio "Maine Calling"
The Metcalf and Small Families: Some Descendants of Michael Metcalf of Dedham, Massachusetts, and Edward Small of Kittery Maine (Boston: Newbury Street Press, 2018).